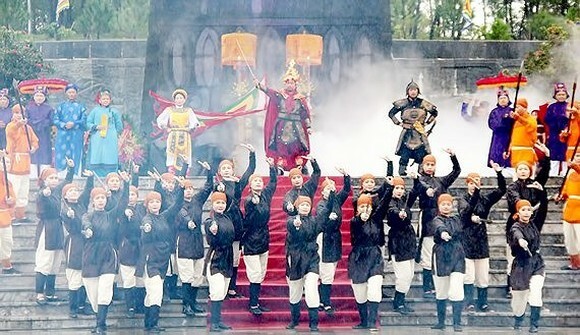 The Central province of Binh Dinh held a solemn ceremony to mark the 230th anniversary of Emperor Quang Trung - Nguyen Hue's coronation and Ngoc Hoi - Dong Da victory over the Chinese Qing dynasty (1789-2019) at Quang Trung Museum in Tay Son Ward yesterday. On the same day, Standing Deputy Prime Minister Truong Hoa Binh, Head of the Central Propaganda Department of the Communist Party of Vietnam Vo Van Thuong led the Central delegation to participate in the range of activities marking the 230th anniversary of Ngoc Hoi - Dong Da victory. On the occasion, the delegation visited and offered incense at the Kinh Thien Palace site, Nguyen Sinh Sac Memorial Site, Tay Son-Tam Kiet (Three Great Heroes in Tay Son) Temple, Emperor Quang Trung Monument, etc. Thousands of local people and nationwide arrivals flocked to the memorial sites to take part in the incense-offering ceremony in memory of Tay Son soldiers. Celebration of the 230th anniversary of Ngoc Hoi - Dong Da victory along with chest, folk games and art performance to mark the glorious victory, Bai Choi ( a traditional game combining folklore singing and lottery picks) took place at the theater in front of Quang Trung Museum’s square last night. The victory of Ngoc Hoi-Dong Da over the Chinese Qing dynasty is well-known as one of the Vietnam’s most important and remarkable historical events for national construction and defense. Nguyen Hue became Emperor Quang Trung in 1788 and passed away in 1792; and Queen Ngoc Han followed him seven years later.